One of the most important things to take into account when suffering from an illness or chronic condition, is diet. Many of us tend not to spend a lot of time worrying too much about what we eat and instead enjoy a wide range of foods and drinks that – although we might enjoy them – can cause us and our bodies to feel worse than we actually should. Why Should I Worry About my Diet? A great number of us – as we have already mentioned – don’t worry about our diets and therein lies some of the problems we have. Yeast, wheat, gluten and diary products can all be very tasty but can also lead to complications if we are suffering from an illness that is related to our digestive systems. Illness and Diet – are they linked? Many sufferers of conditions such as Irritable Bowel Syndrome (IBS) find that their condition flares up if they consume products like milk, cheese, bread, potatoes or foods which are rich in sauces. Irritable Bowel Syndrome (IBS) in particular is much affected by the intake of such products so it is worth while to consult with your doctor or dietician as to which you should generally reduce or stay away from altogether. There are many of us who enjoy a glass of milk but an Irritable Bowel Syndrome (IBS) sufferer will find that they become bloated, suffer from pains in their stomach and have problems with constipation as a result. Therefore it is important – if you suffer for example from Irritable Bowel Syndrome (IBS) – to consult with your doctor with reference to a change in diet. Is My Lifestyle a Problem? Everyone’s lifestyle can be a problem when it comes to illness – be they acute or chronic. We live today in a society where things move apace and we have to move to keep up with them. This means eating as we work, while we travel or simply not eating at all. 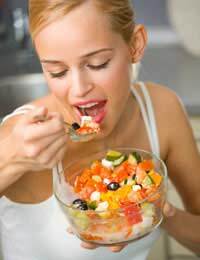 Eating whilst under a considerable amount of stress can also be a problem; studies have shown that individuals dealing with high levels of stress either don’t eat or don’t eat properly. This can lead them to suffer from indigestion or problems with the bowel such as Irritable Bowel Syndrome (IBS). Ulcers are also a common problem for people who live life in the fast lane as it were: Leaking Gut Syndrome which can cause ulcers to form is a condition that feeds on high levels of stress which result in an over production of acid in the individual’s stomach. It is advisable not to simply change your diet; you should consult with your doctor who will give you helpful advice on how best to approach the problem of diet. He or she may advise a change in the level of meat you eat for example and may suggest supplementing your meat intake with a higher intake of vegetables and fruit. It is very common for individuals to consume large amounts of meat and small quantities of fruit and vegetables. Likewise your doctor may ask you to consider the possibility of stopping smoking and reducing the amount of diary products you consume. All of these are useful ways to help control your diet but should be carried out under instruction.